This is a beautiful Decorative wooden sign; Art print reproduction form my original painting carefully crafted on wood , wall sign plaque is sealed with several coats of high quality varnish for easy cleaning with a soft cloth. Romantic with a country cottage style ; nice roses design on crackle backgroud ... with a fun shabby - chic flare. Sign is created on 3/4" thick pine wood . Wood base measures approx: 10 " wide X 7" tall. 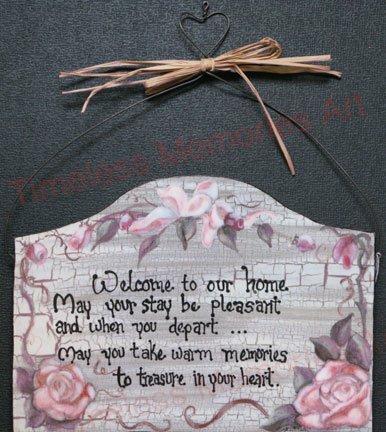 Wood sign Inscription reads:" Welcome to our home may your stay be pleasant and when you depart... May you take warm memories to treasure in your heart"
Custom wood sign plaque lettering is done free hand with a fine tip brush on acrylics to give that country- homemade look. Similar wood sign can be personalized with the saying of your choice. Hand-made wood sign is ready to hang from a handcrafted heart shaped black wire. Every item has been meticulously crafted for quality and lasting beauty; you are buying directly from my Menifee Art studio to your home.